Here's a simple card I made using Hero Arts and Basic Grey products. Love these blue and ledger papers from the Oxford 6 x 6 Pad. Such a gorgeous blue... 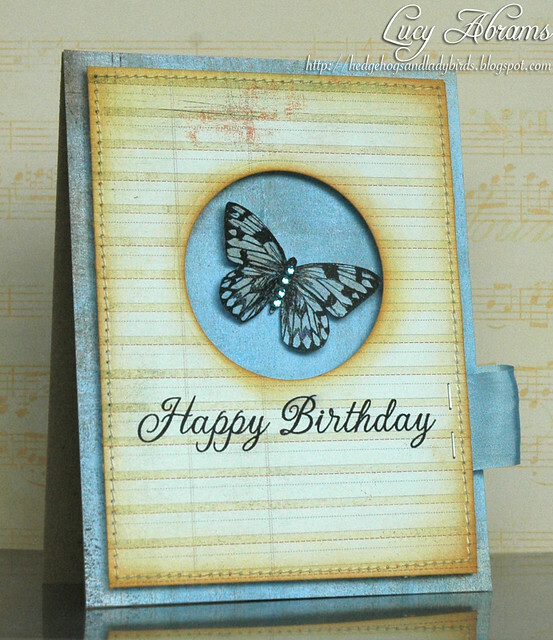 The butterfly stamp is from the Papillions set (25% off HERE) and the sentiment is from Sending Smiles. I added some blue silk ribbon from The Ribbon Girl and tiny staples using my Ranger Tiny Attacher (love it). Love that blue! And I adore how you are showcasing the butterfly! Lovely card... love the blue and butterfly! I would of never thought to combine those colors and they look great! I need to think out of the box more! gorgeous card and how exciting to have a new baby by Christmas time... hope you are overdue and deliver on Christmas Day!